Our Cozy Nest: Super Simple Fall Projects! I never know when I make my daughter a shirt for an upcoming holiday if it's going to be the time she acts like she is way to old to wear something that mom made. But, luckily for me she still seems to like the stuff I make her. I give it another year before she's had enough. I thought I'd do a quick tutorial for this stuff. At church we are having a service auction so I decided to make an apron and hot pad out of some of my left over Gobble Gobble fabric from Moda. 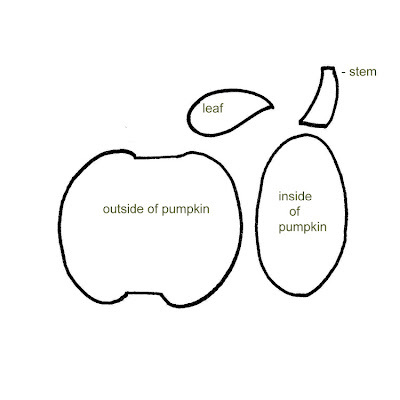 Here are the templates for the pumpkin. You should be able to just click on it and then print it out. You don't need to cut them out just trace them. If you have any problems let me know and I can always e-mail it to you. You will need 4 scraps of fabric. 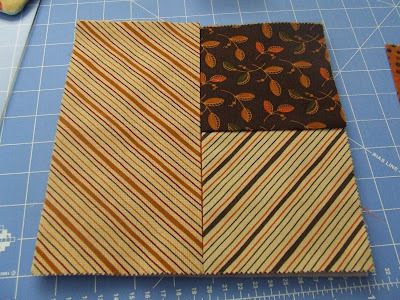 One for pumpkin outside, another coordinating piece for inside of pumpkin. One for the stem and one for the leaf. 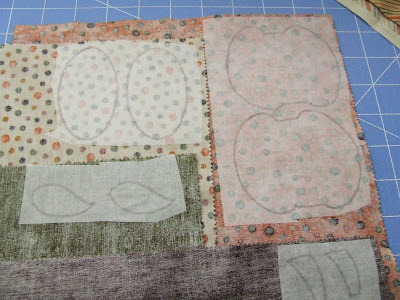 Start out by tracing pattern onto the textured side of Wonder Under or Heat and Bond. I made two of each since I was doing a shirt and apron. 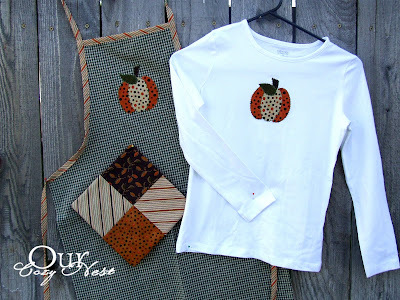 Cut around patterns and iron onto your choice of fabric. Layer the pieces on apron or shirt and then iron. First layer on outer pumpkin piece, then the inside piece, stem and then leaf. 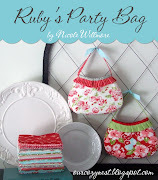 Now using your favorite sewing machine stitch around each piece. 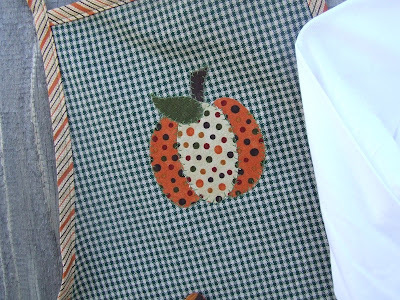 On the apron you could also stitch around pumpkin by hand since the fabric is stiffer. For the apron I just used a tea towel from the local craft store. The usually are around $3.00. 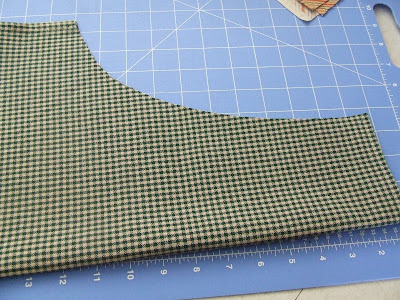 I folded the apron in half lengthwise and placed pattern on the edge and then cut. Here is how it should look opened up. I didn't take pictures on how to finish the edges........sorry! I'll do my best to explain it. 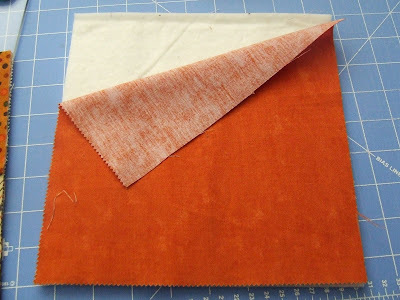 You will first need a 1/4 yard of fabric, cut into 4 - 2" x 45" pieces. First sew 3 of the strips together end to end (this will be used for the neck, sides and tie). I pretty much made my own bias tape out of the 2" strips. You do this by ironing the pieces in half length wise opening it back up. and then ironing the outer edges into the middle crease you just made. Then iron the entire piece in half. If you need pictures click on my tote bag tutorial, I used the same process for the handles of the bag. 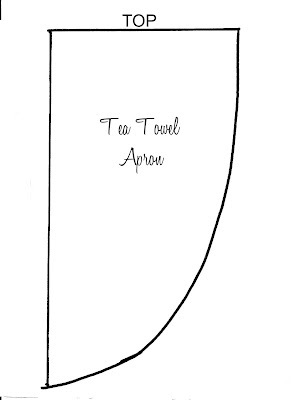 Now that you've made your bias tape first sew the single 2" strip onto the top of apron. Do this by opening the bias tape and with half on the front of apron and half on the back, sew on using about a 3/8" seam allowance. Cut off the excess from the edges (yes there is a lot of excess). Now fold your long bias tape in half, where the fold is will be the the top of the apron that goes around your neck. 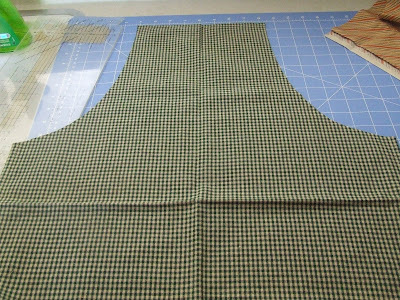 Decide how big you want the neck to be and the, pin the rest where you want it start on apron. Do the same thing as you did on the top, open bias tape and sew on with half of the front and half on the back. Sew bias tape on the side of the apron that you cut, then sew the rest of the tape closed until you are about two inches from the end. Finish of the end by folding the bottom up about a half inch then fold bias tape back up and sew to the end. If you don't want to do this you could always just tie a knot. Ok, last step I promise. Now just sew up the bias tape at the top where it goes around the neck. And YOUR DONE!!! This hot pad is way easy I promise. Here is what you will need. 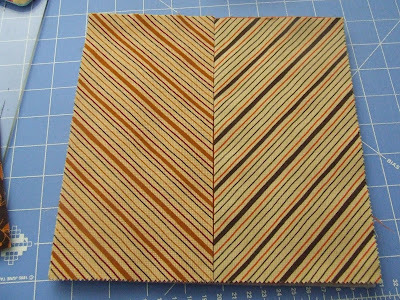 Two pieces of Warm and Natural that are 8 1/2 inches square. 5 - 8 1/2" x 8 1/2" pieces of coordinating fabric. Four will be used for the top of the hot pad and one on the back. Decide what pieces you want to use on the front and then iron them in half. Layer pieces together with the Warm and Natural on the bottom and then the piece of fabric you choose for the bottom next. 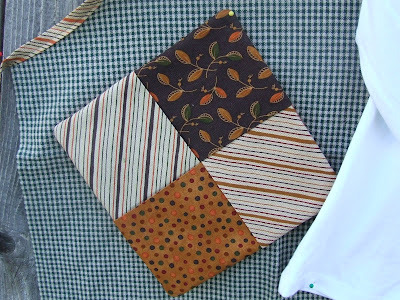 Now pick two of your folded piece and place them on top of the fabric your using for the back. Make sure the folds are in the center. The other two pieces your pretty much weave in like a basket with half the fabric on top and half on the bottom, still making sure the fold is on the inside. Now pin in the middle of all four pieces. Sew around the entire outside of hotpad using a 1/4" seam allowance. 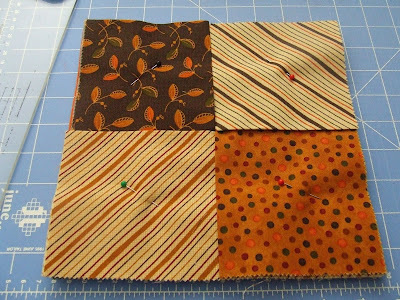 Trim edges and then turn by opening up the four fabrics in the middle and turning them onto the back. Iron hot pad so it looks nice and pretty and ta da your done! Hopefully this all made sense. It your have questions or I've totally confused you, please feel free to ask any questions. If you don't have a blog just leave me your e-mail address! These are so cute. Thanks for sharing, I hope to do the t-shirt and hot pad. Thanks again. 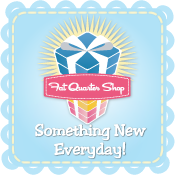 Love your blog and all the helpful hints/tips. Have a great day. When do you want me to come and pick up Ashley's? They're all adorable. Thanks for sharing the template for the pumpkin. I think my girls need seasonal tees made tomorrow! What fun projects! How close are we to getting that baby here? I'm so excited for you. I hope life is treating you well. what an adorable shirt! I want one, thanks for the tutorial too...maybe I'll give it a try. Though sewing has never been a good fit for me. I'm so excited you are bringing that to the service auction! They are darling! Hey girl, how can I get into your ward? They are darling! You must have an amazing Mom to have instilled such craftiness. (Tee-hee) They are darling, no kidding. 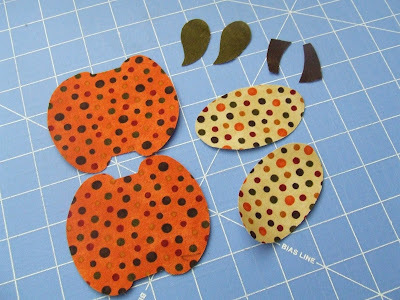 Those are great projects - love your pumpkin template. And what a great idea to use a tea towel for an apron! Thanks for sharing! I have made my little girl a shirt for this year already but am printing this out so I am ready for next year! That potholder is so pretty I would be afraid to use it and get it dirty....but I want to try one. p.s. I wanted to make my kids costumes but Ben-9 said I am not wearing something you made! He watches me all the time but ? 's me about some of my fun crazy ideas...he is so fun to have around. Those are adorable!! Thanks so much for showing us how to make them! I'm really going to have to start wearing aprons, there are so many cool ones out there. Nicole~ these are adorable! I saw that they were featured over on "Be Different... Act Normal" which I think would be quite an honor. Way to go! 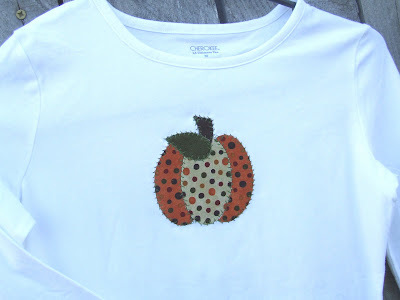 Hi, can you please tell me what kind of stitch you used on your machine to attach the pumpkin to the t-shirt? I keep trying a zig zag stitch and for some reason the material keeps bunching up under the needle. Very sweet! I do have a question about the wonderful Bake Shop Gobble Gobble runner and topper: how big do you cut the cream borders? thank you! You make so nice thing! I like this tings you have on "moda bake shop! Do you want to make somethings like that for me? 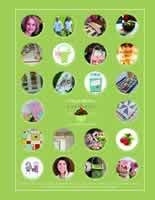 Such fun ideas...and I have to tell you I absolutely love your Moda Bakeshop projects...love the scalloped edges!!! Brilliant idea making an apron from a tea towel! I love it. Just one question on the bias tape...does it tie around the neck or loop around? Thanks! I looped it around, but if I were making it for someone else I might make it have a tie! Ya never know what is going to fit someone else! Thanks again for the great template. I love the hotpad idea. I have never heard of warm and natural. Would I find that in a fabric store? I am going to have to try that hotpad idea. It looks like a quick gift idea to make for others. not a negative thing ....and sure pregnancy brain ought to be on this record lol I feel so dumb often . I only have a few hundred "friends" on Fb simply because I only "friend"
types I perception I will get to understand better/am obtaining to know. "I'm so excited about my day tonite!" or alternately "Boy that was a dull date." that are not them. And identical goes for me, I never need to see regarding their dates. not shove it in someone's encounter. Now, if the particular person I am dating is such as you and "friends" everybody they meet, then a little status like mine goes to obtain lost within the flood, and does not subject. But, I just believe it is great manners to not require an individual in Fb circles until it's far more "serious." Many thanks for crucial guidem to attaining bodyweight. These are so nicely carried out. We transformed our drop into a "pool"
house and I am nevertheless working around the within. I take advantage of it being an office room and like a party space when we have household and close friends over. TED: bought and sold from the highest bidder: fear. Unfortunately, the flatlanders have only additional pancaked their own one-dimensionality. developing complement around the market for years. Who reads this blog anyways??? We gotta lot of Grape Juice! Baby Quilt for my Nephew!